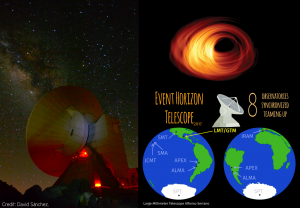 The Event Horizon Telescope is a network of eight millimeter-wave radio observatories located on four continents and representing over 20 nations. These observatories work together as a single Earth-sized telescope using the Very Large Baseline Interferometry (VLBI) technique. 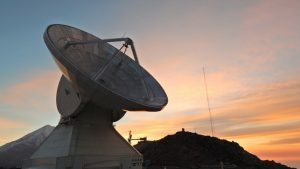 One of these facilities is the LMT, a 32-meter single-dish millimeter-wavelength telescope led by the Instituto Nacional de Astrofísica, Óptica y Electrónica (INAOE, Mexico) and the University of Massachusetts Amherst (UMass, U.S.A.). 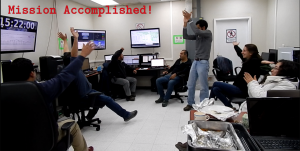 Each night, the LMT synchronized (with a precision higher than 10-12 seconds) with the other telescopes using a hydrogen maser and recorded approximately 30 Terabytes of data which were stored in Mark 6 data systems developed by the Massachusetts Institute of Technology (MIT) Haystack Observatory. Figure 2 (Left) LMT while observing at Sagittarius A* for the EHT project. Credit: David Sánchez. (Top-Right) Simulated image of an accreting black hole. The event horizon is in the middle of the image, and the shadow can be seen with a rotating accretion disk surrounding it. Credit: Thomas Bronzwaer, Jordy Davelaar, Monika Moscibrodzka, Heino Falcke, Radboud University. (Bottom-Right) The EHT is formed by eight telescopes around the world: the Submillimeter Telescope (SMT), the Submillimeter Array (SMA), the James Clerk Maxwell Telescope (JCMT), the Atacama Pathfinder Experiment (APEX), the Atacama Large Millimeter Array (ALMA), the South Pole Telescope (SPT), the Institut de Radioastronomie Millimétrique 30-m Telescope (IRAM) and the LMT. 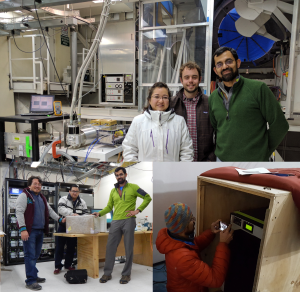 Figure 3 (Top) Left to Right: the 1.3-mm receiver, Sandra Bustamante, Aleksandar Popstefanija and Gopal Narayanan. (Bottom-Left) Sergio Dzib, Antonio Hernández and Gopal Narayanan, at the back stands the backend system with the Mark 6. (Bottom-Right) Gopal Narayanan checking the hydrogen maser. The first target of the observing run was a binary black hole called OJ 287. This object is scientifically interesting all on its own, but because it is a deeply studied object, it will instead be used to calibrate the observations of the project’s primary observing targets. These are Sagittarius A* (Sgt A*), the supermassive black hole at the center of our galaxy, and the supermassive black hole in M87, the most important object of the first night since Sgt A* observations were planned for the following days. Figure 4 (Left) Members of the EHT project infront of the LMT. From left to right: Aleksandar Popstefanija, Michael Janssen, Sandra Bustamante, Lindy Blackburn, Katie Bouman, Gopal Narayanan and Edgar Castillo. (Middle) Lindy explains the data recording instructions to the students. (Right) Telescope operators David Sánchez and Edgar Castillo. Credit: Ana Torres Campos. Figure 4 Sunrise at the LMT while observing at Sagittarius A*. Credit: Ana Torres Campos.